In my article “Binary Division” I showed how binary long division converts a fraction to a repeating bicimal. In this article, I’ll show you a well-known procedure — what I call the subtraction method — to do the reverse: convert a repeating bicimal to a fraction. A bicimal is the base-two analog of a decimal; it has a bicimal point and bicimal places, and can be terminating or repeating. A terminating bicimal has a finite number of bicimal places; a repeating bicimal (also known as a recurring bicimal or periodic bicimal) has an infinite number of bicimal places, due to a sequence of digits that repeat forever. There are two types of repeating bicimals: pure repeating (also known as immediate repeating or strictly repeating) and mixed repeating (also known as delayed repeating). In a pure repeating bicimal, the repeating part (also known as the repetend) starts immediately after the bicimal point. In a mixed repeating bicimal, a non-repeating part starts immediately after the bicimal point; it is then followed by a repeating part. 101.01 (a pure repeating bicimal). 11.1110 (a mixed repeating bicimal). Like decimals, bicimals are created from fractions through long division. Also like decimals, bicimals can be converted back to fractions. You convert a bicimal to a fraction the same way you convert a decimal to a fraction — you just work in binary instead of decimal, and use powers of two instead of powers of ten. Repeating bicimals take more work to convert. There are several methods; I will describe the subtraction method. In the subtraction method, you take a bicimal b and create an expression that subtracts out its repeating part, and then rewrite that expression so that b is expressed as a fraction. Specifically, you create two nonnegative power of two multiples of b, mb and nb, such that mb – nb = i, where i is an integer. Using simple algebra, you rewrite this expression as a fraction: b(m-n) = i, or b = i/(m-n). which in decimal equals 16/3 = 5.3.
which in decimal equals 47/12 = 3.916. You can perform the subtraction method using only binary numerals (thanks James for the comment); I will redo the two examples in this way. You don’t need to do any arithmetic to compute (2r – 1)2p: it is a string of r 1s followed by p 0s. For example 1, r = 2 and p = 0 gives 11; for example 2, r = 2 and p = 2 gives 1100.
which you’d then say is 101111/1100 in binary. Conceptually, I see the process as bicimal -> fraction written in binary -> fraction written in decimal -> decimal, which is why I prefer my presentation. Read my articles about the direct method and the series method — two other ways to convert a bicimal to a fraction. Good method! Am I right in saying that this should work in all bases? Yes, it’s good for any base (of course you must have the means — like Wolfram Alpha — to do arithmetic and base conversion in that base). I think I like your way better: all numerals are in one base, and the required left shifting is more apparent. Your examples also highlight the form the denominators take: decimal, 9s followed by 0s; dozenal, Ɛs followed by 0s; hexadecimal, Fs followed by 0s. I will talk about this more in my next article, which will discuss what I call the denominator method direct method. As usual, thanks for the comment. 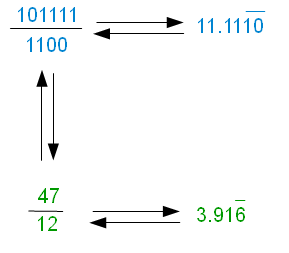 Binary Numbers and Binary Addition. A Lifelong Lesson in Floating-Point.